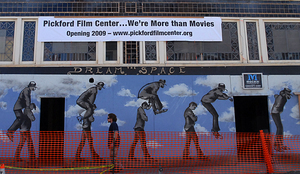 Bellingham Herald – September 16, 2008 | Ruthie V.
BELLINGHAM – Whatcom Community Foundation has donated $124,000 toward construction of the Pickford Film Center, which is now set to open in late spring. The two-screen cinema is being built in a 100-year-old building at 1318 Bay St. that’s being renovated at a cost of a little more than $1.8 million. Money will come from a $2.8 million capital campaign that the center has launched for construction and other costs such as fundraising, relocation and to pay back a loan. So far, the campaign has raised about $1.8 million through pledges, grants and donations. The foundation is a charitable organization that gives out grants. The current theater – The Pickford Cinema – opened in downtown Bellingham in 1998 by a group of film-lovers working to keep independent cinema alive in the area. When completed, the new Pickford center will have two theaters – one that seats 90 people and another that seats 145. The existing cinema on Cornwall Avenue has only one theater that brings in an average of 125 people per day. The new cinema will be able to triple that number by bringing in 300 to 500 people. The center’s other offerings will include a café, a space for meetings, central lobby for arts events and a larger concession stand.